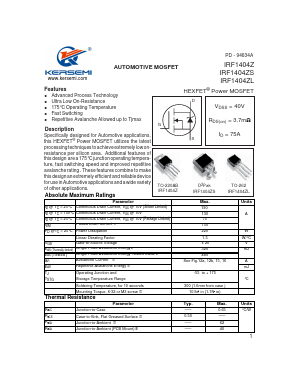 IRF1404Z Datasheet PDF - Kersemi Electronic Co., Ltd. Specifically designed for Automotive applications, this HEXFETÂ® Power MOSFET utilizes the latest processing techniques to achieve extremely low on resistance per silicon area. Additional features of this design are a 175Â°C junction operating temperature, fast switching speed and improved repetitive avalanche rating . These features combine to make this design an extremely efficient and reliable device for use in Automotive applications and a wide variety of other applications.